I am still a newbie when it comes to alcohol. For the first 19 years of my life I was a Mormon, and when I turned 21 I was pregnant. The majority of my legal drinking life has been restricted one way or another. This past year (mostly) has been my largest period of time I have been able to explore alcohol. I love trying new drinks, and pairing foods with with drinks. Alcohol is not all about getting drunk, it can really elevate a meal. However, this drink is pure enjoyment for its taste alone. Recently, I discovered I like gin. I had my first gin and tonic (g&t) a couple weeks ago and really enjoyed it. I was looking up different gin drinks and recipes and found one for a “Gin cup”, which is a spin off a Pimm’s cup. Pimm’s is a gin based fruity liqueur. 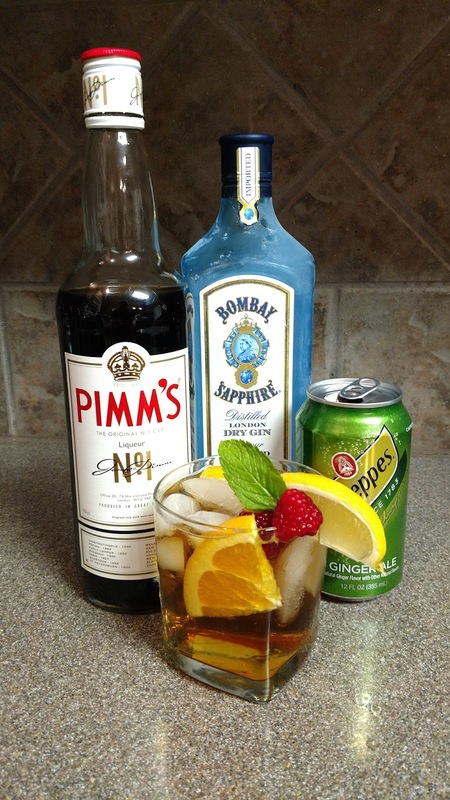 In my early alcohol days I really enjoyed Pimms and ginger ale, as my palate developed, it became too sweet. When I saw a recipe for a “Gin cup” I was extremely excited, because I can now enjoy the taste of Pimm’s matured with gin. It’s perfect. I have perfected this recipe for my taste. I think this is the perfect amount of sweet and tart. For a sweeter drink leave out the tonic water. For a more tart drink, add less ginger ale and more tonic water. Have fun experimenting with it and making it perfect for your tastebuds. A non metallic stirrer. Like a glass cocktail stirrer. I always have plastic baby spoons around, they work perfectly to stir cocktails! Most importantly you need a small measuring cup. 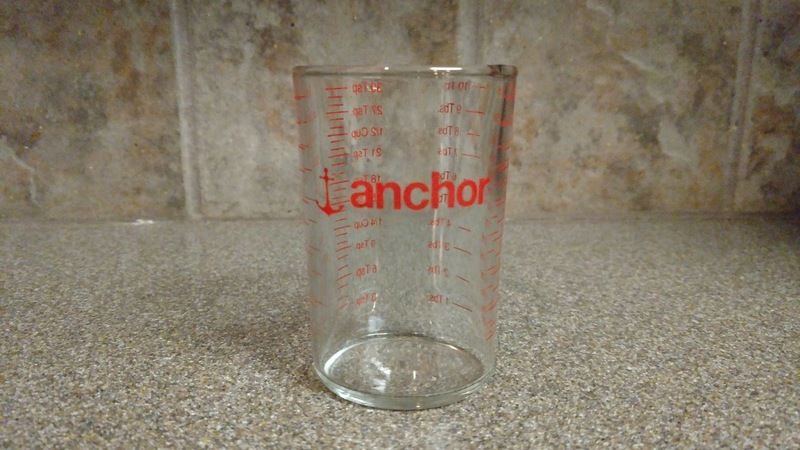 I found a 5-ounce Anchor glass measuring cup at Walmart for about two dollars. 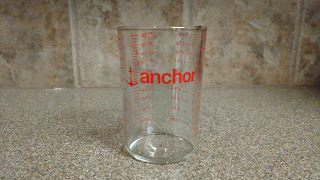 I use it all the time for measuring small amounts of liquids. Prep all of your ingredients. Chill your gin in the freezer, chill your ginger ale and tonic water in the fridge (Pimm’s stays on the counter at room temp). Slice your fruits. I just use whatever I have on hand. The lemon is most important in my opinion, the orange is also pretty flavor changing, the rest of the fruits and herbs do add flavor but the drink is still very good without them. Fill your short glass about ⅔ full with ice. Add the orange, cucumber, and berries to the glass. Measure and pour your gin into the glass, then your Pimms. Next measure and pour your ginger ale and tonic water. Last, give it a good stir and garnish with mint leaf, and lemon. 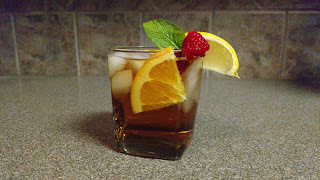 I love this drink, it is definitely a girly drink, but it is a less sweet, more boozy version of the traditional Pimm’s cup. I plan on posting more drink recipes in the future, but knowing me I will get pregnant in the near future and drinking will be postponed. Thanks for reading!